Sablefish, although sometimes referred to as black cod or Alaskan cod, has no relation to the cod species whatsoever. This buttery white-flesh fish was traditionally eaten only smoked. That is until chefs realized just how good sablefish really is. 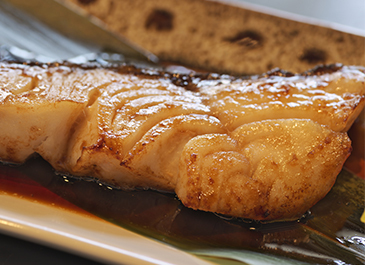 When harvested using long line fishing methods, sablefish is a sustainable choice. It’s a deep water fish found in the Northern Pacific. You’ll generally find sablefish in fillet form but occasionally as steaks. It’s a high-fat fish with dense flesh that makes it ideal for hot smoking. But that’s not the only way to serve sablefish. Think broiling, baking, pan frying or poaching. One of my favourite things about sablefish is that it’s low maintenance. Very little needs to be done with it in order to maximize flavour. In fact, I encourage you do mess with sablefish as little as possible, which will enhance its natural flavour—not overpower it. For all of you sablefish starters, stick to simply pan frying the fish on medium-high or baking between 375 and 400°F for about 10 minutes (possibly longer if you have a thicker filet). Remember, however, to always season with at least salt before cooking. If you’d like to venture beyond pan frying or baking, start by adding 1 or 2 dried spices to the salt for seasoning. Corriander and cumin; cinnamon and clove; chili flakes and fennel seeds; or black pepper and organic lemon zest are all good combinations for this fish. You could also think about marinating sablefish in your own home creation. Test out ginger and sesame or garlic, fresh herbs and olive oil. Finally, you could serve a simple reduction alongside your simply baked sablefish fillet. Carrot and coconut or beet juice and ginger would pair really well. No matter how you approach your sablefish, remember to keep it simple. If the flavours of your marinate or rub are too complex, you’ll lose that delicate buttery flavour of the fish. Sprinkle the flesh side of the sablefish with Chinese 5 spice, salt and chili flakes. Set aside. In a heavy-bottomed skillet, heat coconut oil on medium-high. Fry bacon for approximately 4 to 5 minutes or until done to your liking. Remove the bacon and set it aside, but keep the skillet on medium-high. Add garlic to the skillet along with the sablefish, skin-side up. Sear for 3 minutes then flip and sear for another 3 minutes. Remove sablefish from the skillet and set aside. Using the same skillet, add the leeks and sauté 3 to 5 minutes or until they start to brown. Add the cooked bacon back into the skillet along with the Swiss chard. Cook all together for about 3 minutes. Pour in the beet juice and white wine. Let it come to a simmer and reduce for about 3 minutes. Add lemon juice and cook for another 2 minutes. Place the sablefish on top of the mixture, skin-side down. Cover the skillet and cook for 5 to 6 minutes. Depending on the thickness of the fish, you may need to cook it a bit longer. Plate and serve hot, taking care to watch for bones. *Freeze leftover beet juice in ice cube trays and use over time in your cooking. After a long day in Choices Commissary Kitchen, Antonio often turns to seafood for dinner. It’s simple to prepare, delicious and healthy. For more great dinner ideas, visit choicesmarkets.com and test out more of Antonio’s recipes. Or buy a copy of one of Choices’ Wellness Guides that are brimming with easy recipe ideas from our talented chef.